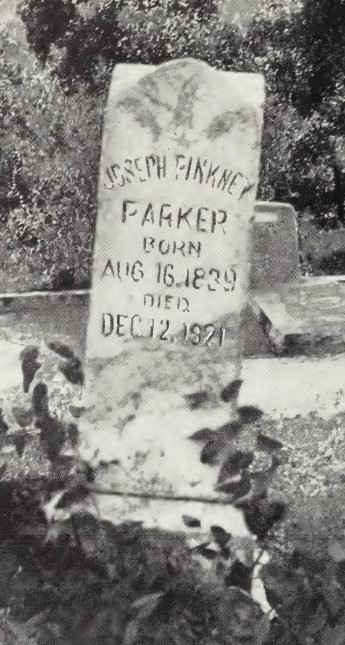 “Joseph Pinkney Parker was born in Coffee County, Alabama in 1839. He had just finished as a student at Spring Hill Academy when the War broke out. He left immediately for the front, leaving behind him on a well-stocked plantation, his sister and the slaves which every well-to-do Alabaman possessed at that time. Four years later, he returned to find his farm overgrown with weeds, his stock and his slaves disappeared and his sister embittered by her treatment received at the hands of the Northern soldiers. The property was soon eaten up by taxes, so he took a position as a “walker” on the railroad tracks carrying with him maul and spikes to keep the tracks repaired. He became a school teacher, but the parents of the children were too poor to pay the salary, or even to clothe the pupils properly. As years went on, he did regain some of his financial position and built for himself and his family a very comfortable home in Troy, just a block or two from the famous trace which Andrew Jackson used in his battles against the Indians in Florida. Pink was a devout member of the Baptist Church. He never called his wife anything but “Darling” and taught his children to do the same. He became a police officer in the little town of Troy and a much-respected citizen. But he had one obsession which was so deeply instilled in him that he never was able to overcome it; a deep and lasting hate for the North, its people, and particularly for the man who was the sixteenth President of the United States ; a man so great that, today, Abraham Lincoln is revered in the South, together with the famous champion of the Lost Cause, Robert E. Lee. 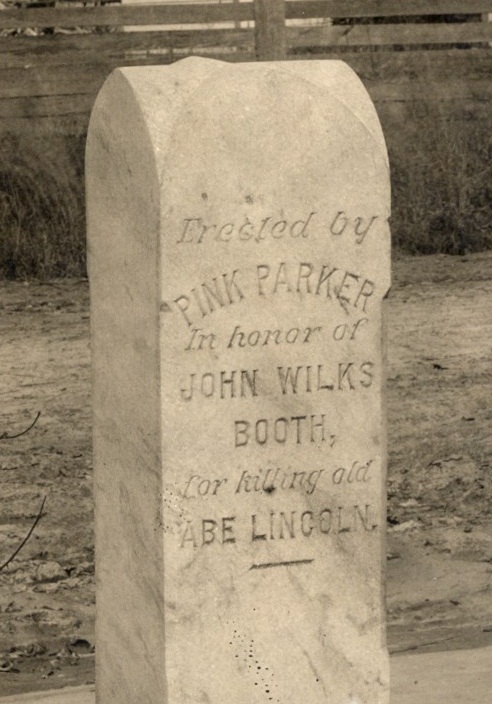 Time went on and each succeeding April 15, Pink would make for himself a paper badge indicating that this date was the “Anniversary of the Death of Old Abe Lincoln.” Years passed, the idea came into his head that he would erect a monument to the memory of John Wilkes Booth. Apparently, he did not share this intention with anyone, so it was a surprise to the citizens of Troy when this monument, some four feet high, was erected in the yard of Pink’s home. His neighbors did not like the idea, but they did like Pink Parker. The strange thing about the erection of this monument is the fact that it was not erected until 1906, in spite of the fact that the newspapers of the 20’s stated that it had been erected by popular subscription by the citizens of Troy in 1866. Pink Parker on April 15th, 1906 – The day he erected his monument to Booth. Notice his paper badge celebrating the 41st anniversary of Lincoln’s death. No one paid much attention to the monument. Automobiles were not as plentiful as they are today and traffic did not flow through Troy as it does now. Pink was pretty proud of his handiwork and he used to regale his grandsons with the story of his sending President Theodore Roosevelt a postcard inviting him to come and visit the monument. He further informed the President that while he couldn’t furnish a carriage for him, he would get him a dray hauled by a couple of mules. When, in 1921, Mrs. C. D. Brooks, who at the time was the president of the Woman’s League of Republican Voters in Alabama, heard of this monument, her pride for the state of Alabama was so strong that she began immediately to have the monument destroyed. Mrs. Brooks received letters from all over the country supporting her stand. One of the most interesting letters which came to her was dated June 8, 1921, El Paso, Texas, from Alexander Donald McEvoy, who states that “in the year 1879, I met Booth in Buenos Aires, Argentine Republic.” That letter would have pleased Pink Parker, for he always maintained that Booth was not the man whom Boston Corbett shot. The preceding came from the 1951 booklet entitled, A Monument to the Memory of John Wilkes Booth. The author gained his information from two of Pink Parker’s grandsons. Thanks for sharing this interesting story. James O. Hall first told us about this nearly forty years ago, and all of us old Boothies had a good chuckle over Pink being the prime example of an unreconstructed Confederate – or at least one who never turned Lincoln into an icon. I had a picture of Pink’s memorial to Booth in my files and when I stumbled across the short booklet devoted to it, I knew I had to post about it. Though a Yankee myself, I couldn’t help but laugh when I read his comment regarding how he didn’t believe there would be many Yankees to bother him up in Heaven. I love the picture of him wearing his badge in celebration of the anniversary of Lincoln’s death as well. From this account, it’s clear that Mr. Parker was quite an interesting character. Quite a character, Dave! Thanks for the story. Old Pink was obviously a hard nut to crack! I wrote about this in one of my old Lincoln Log newsletters. (The Surratt Society has a complete run, and the index, which Arthur Kincaid compiled.). I used that same picture, cut from a magazine article. That’s a great quality copy of that picture that you used! They don’t know what happened to the memorial?? I like it. Interesting story. As the article states, the memorial was re-etched and used as Pink Parker’s gravestone.